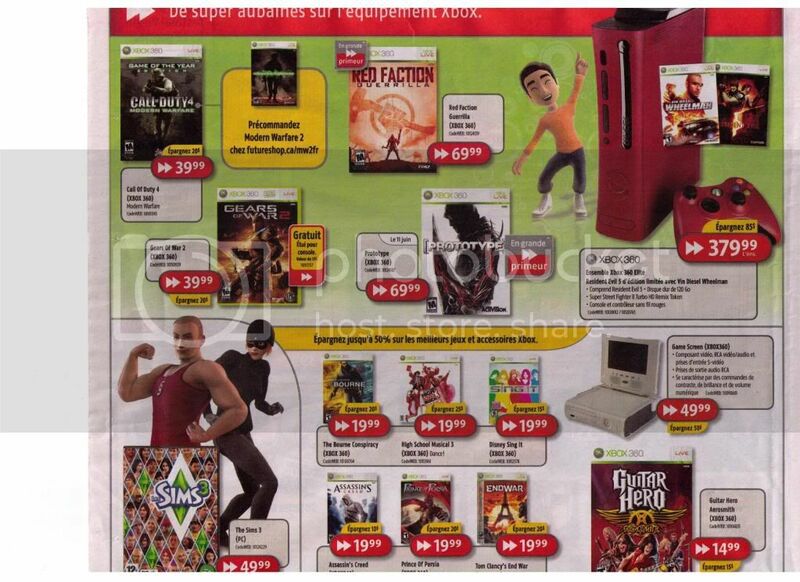 We got tipped off earlier today by a reader that RedFlagDeals is currently ablaze with discussion about a slew of Future Shop deals for the Xbox 360 beginning on June 5. According to the post, a number of top quality Xbox 360 titles including Mass Effect, Dead Space, Lost Odyssey, Too Human, Fracture, Stranglehold and Thrill Off The Rails will all be on sale for the rock bottom price of $9.99. There is also four notable games reduced to $19.99 including Bourne Conspiracy, Prince of Persia, Assassin's Creed and End War. The RedFlagDeal thread is currently 32 pages long so clearly there is a lot of anticipation for this sale. Now if you're wondering if this is legit, it is. I just checked through my stack of weekly flyers that came in this evening and the Future Shop flyer is indeed advertising all of these deals. This makes me really happy. I can't believe Dead Space is $9.99, that's insane. I paid $60 for it last November, and it was more than worth that amount. I can't even begin to express how worth it that game is for less than 10 bucks. Think I know what I'm doing tomorrow. Why do we keep on buying games when they first come out... DAMN YOU DEAD SPACE! YOU AMPUTATED MY WALLET! Amazing deals. I no longer have any excuse to avoid Lost Odyssey. Too Human is a questionable purchase at $60 but at $9.99 it is a loot-grinder's Deal of the Year. agreed, agreed, and agreed. Every time I look at these deals I get antsy.